Kurtis and Matt Williams, the main operators of Waterwheel Gardens, are committed to serving the Wood River Valley's food community. You can spot the Waterwheel Garden's sprinter van making deliveries, rain or shine, to valley restaurants and markets every week throughout the year. Located in Emmett, Idaho, Waterwheel Gardens is in a prime location for longer seasons and abundant sunshine, plus a commercial kitchen for providing second-season or value-added produce during the winter months. When and why did your family start farming? ‍We started our farm in 1995. We moved to Emmett in 1993 and realized the need for more locally grown food and farmers' markets. We love growing things. We’ve always had a garden, and Kurtis went to Cal Poly San Luis Obispo and studied ornamental horticulture and fruit science. Being able to take it full circle, from planting to harvesting to selling direct to our customers is very fulfilling. What’s it like to raise a family on a farm? What do you produce on your farm? Anything extra unique or fun to grow? We grow just about every type of berry that we can, and a wide range of fruit and veggies. We do farmers' markets year round, but the bulk of the markets are April through October. Our goal is to have a full table of quality products for every market we attend. Golden raspberries and Italian flat Romano beans are some of the more unique and fun things we grow and get the most attention and questions about at the markets. Our biggest challenge, and also biggest success, is balancing the amount of work that has to be done at the farm and in the orchards while also attending the markets thatwe’ve committed to. So much work is done early in the spring, trying to get ahead, so that when the busiest part of market season (June through September) is in full swing, we can maintain a schedule of harvesting on Mondays, Wednesdays and Fridays, and going to markets on Tuesdays, Thursdays and Saturdays. There are a few. Joel Salatin is, by far, the most popular. He has a very unique and positive attitude toward farming that we really appreciate. We don’t copy all that he does, be we try to approach our business and the markets with that kind of attitude of appreciation and adaptability. 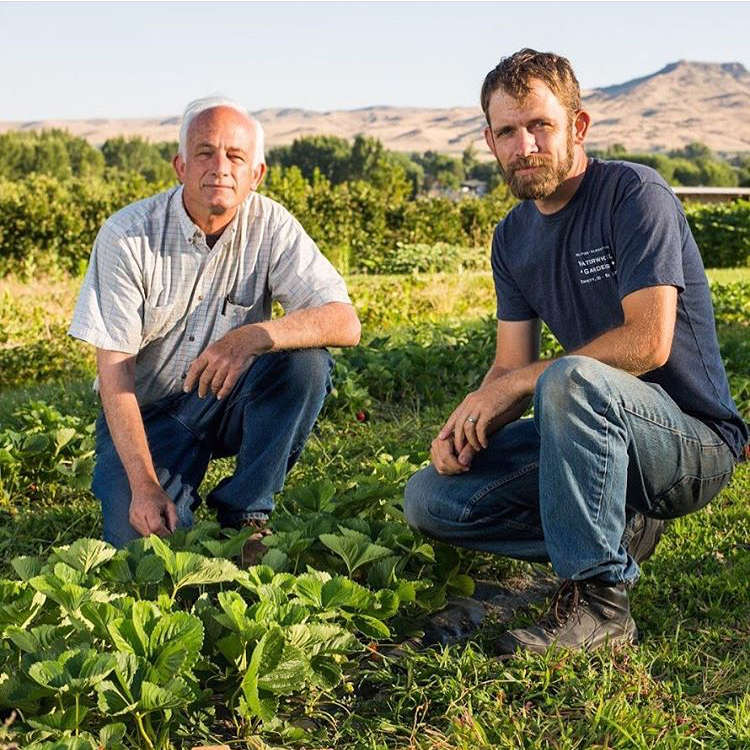 We also admire so many of the local farmers here in the Emmett Valley over the years that have been willing to share what they’ve learned about our soil and climate has been invaluable. Supporting small local businesses is so vital to the local communities and economies. Helping to support our local farmers and food producers is incredibly important. Not everything can be grown hundreds of miles away and shipped in, for us to have reliable and sustainable access to food. In certain areas, it does cost more to shop locally grown, but there are many benefits to supporting small businesses that far outweigh those costs. Not to mention, fresher food tastes better! How do you feel about the organic label? It’s too complicated. We use a lot of organic practices on our farm where possible, but the certification process and maintenance is not worth it to us and the way we market our products. We get to see our customers face-to-face and explain how we do what we do to them directly, and that is a huge positive for us. We grow such a wide range of things, not just veggies and fruit but also flowers and herbs, and we try and create a great environment for beneficial insects. We grow some cover crops and do a lot of crop rotation, as well as adding a lot of compost to our planting areas and berry plants each year. It’s vital to our way of life. Everyone needs to eat, and the more local we can shop for our food, the more reliable our food system will be. We all need to make an effort to support farmers, and encourage new farmers. As our older farmers retire, we need young farmers to know that what they’re doing is appreciated and encourage them to continue to grow. What change would you like to see in the Wood River Valley region and/or Idaho in terms of food? We get a ton of support from Wood River Valley and Treasure Valley residents and visitors every year, more and more! The Wood River Farmer’s Market in Ketchum and the Capital City Public Market in Boise are two of the best markets in the state of Idaho, and we’d love to see more local government support, especially at the city level, for farmers' markets and similar opportunities for local producers to do business. Unfortunately, when farmers' markets are successful and draw a crowd, it seems that city planners view the market more as a nuisance and a liability than a benefit. Where are your products available - restaurants, retail stores, your farm stand/upick schedule? We attend every Wood River Farmers' Market in Ketchum and Hailey (June through Mid-October) as well as the Capital City Public Market in Boise (April through December) and the Main Street Market in Meridian (June through August). We also sell year round - once a week - at Nourish Me in Ketchum. We sell to several high-quality restaurants that emphasize their appreciation for local producers, such as CK’s Real Food in Hailey; the Warfield in Ketchum; the Konditorei in Sun Valley has been consistently buying from us this year; and several others. In Boise, we work with a lot of great restaurants including Fork and Alavita, The Modern, Richard’s, Juniper, State & Lemp, Camel’s Crossing in Hyde Park, and Grit in Eagle. This year, we started working with Txikiteo, Luciano’s and The Local! We do sell from our fruit stand seasonally and by appointment, and do some U-pick for our cherries, strawberries and blackberries when we have large crops. We also sell our jams and jellies at a couple local stores that are open all week - Nourish Me in Ketchum, Zeppole’s Bakery in Boise and City Peanut Shop in Boise!